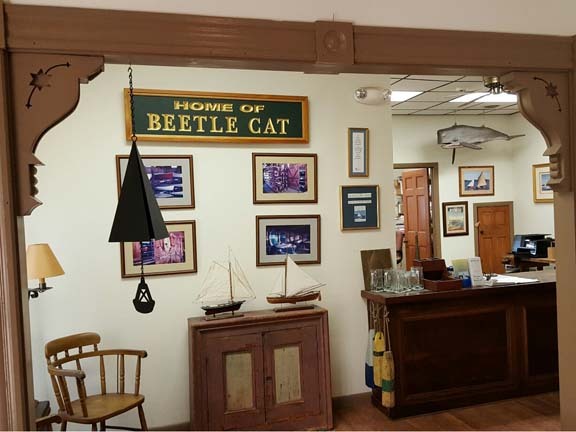 When Bill Womack found the perfect location for the Beetle Shop in 2004, the facility he purchased was a drab metal fabricating shop. He and the crew worked diligently to transform the property into the Wooden Boat Center, home of the Beetle Cat sailboat and other traditional wooden boats. 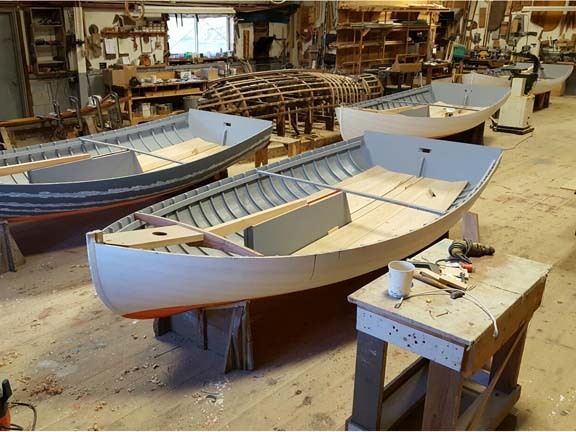 It has been over 12 years in the making, and we continue to expand as time and money will allow to accommodate the demands of the wooden boat community. 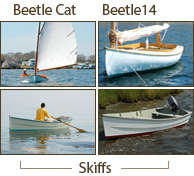 From a modest 40 Beetle Cats in storage in 2004, we proudly store and maintain over 200 Beetle Cats and 30 other classic boats of various sizes. A visit to the Beetle Shop is like a step back in time. 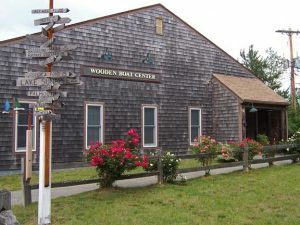 The pleasant smell of cedar greets you as you walk thru the front door and into the office, which is lined with historic photos and memorabilia. From there you enter the show room containing the newest boats on display, along with our gift shop. This leads to the main shop where form follows function. The right side is the Beetle Cat construction side, which contains the original mold from 1946, and allows for 6 new Beetle Cats to be built at a time. 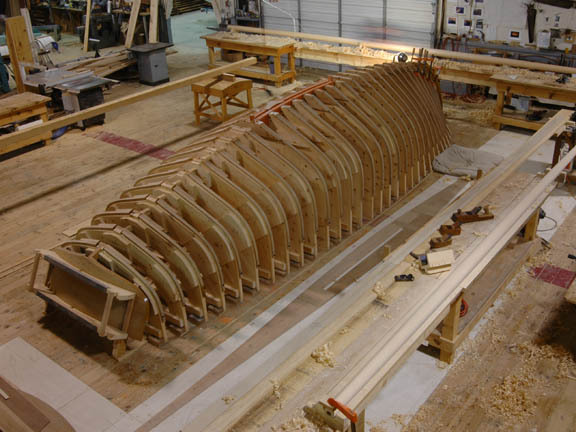 The middle bay is set aside for custom boat building and large boat maintenance, along with production of spars and flagpoles. The paint shop is enclosed along the back wall of the shop and into the far bay, and is adorned with the doors and historical items from the old Beetle Shop. The Beetle Shop has gradually expanded to two 5,000 square foot storage buildings, pine sided and racked out by the crew using locally sourced pine. 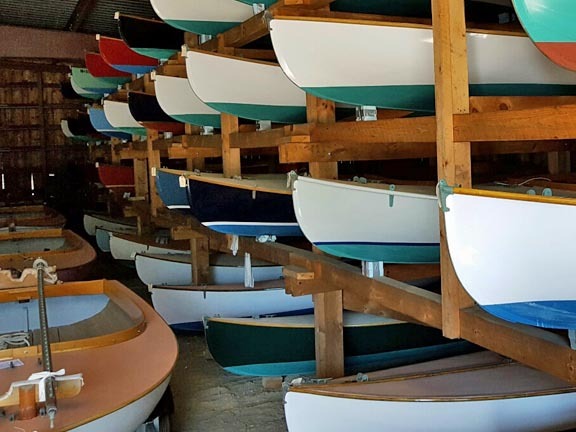 The spar shed was custom built for storage of spars, rigging, centerboard and rudders, as the boats are stripped of all their gear in the fall. The sails and covers are stored inside the main buildings sail loft. The Beetle family was famous for its production techniques, as Henry Ford famously visited the shop when creating his assembly line. The tradition continues, as the patterns are all neatly hung and labeled with instructions, fasteners of all size and shapes organized neatly on the shelf, “kits” specially made up for specific tasks, a designated spot for each tool, and wide open shop space allowing the boatbuilders to easily move around the hulls during construction. 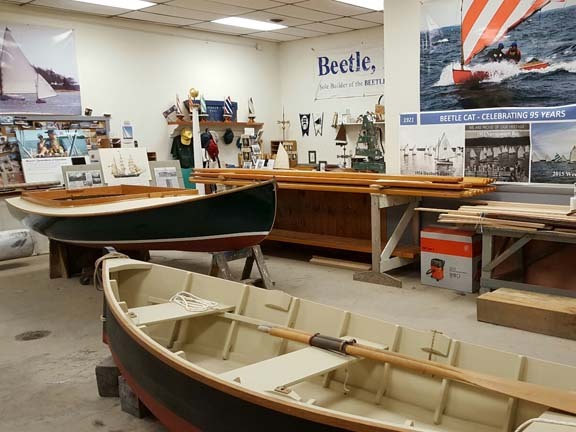 Our December Open House provides wood boat enthusiasts a chance to tour the Beetle Shop, see Beetle Cats under construction, admire other traditional wood boats tucked away for the winter, and share their stories of summer adventures on the water both recent and generations ago.